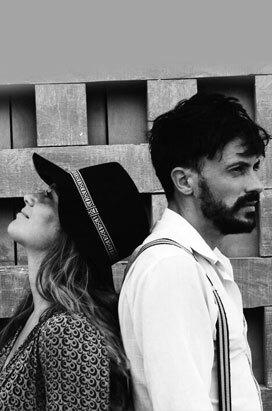 Initiated by filmmakers and ‘explorers of the sacred’ Vincent Moon and Priscilla Telmon, Labyrinths invites us on a musical and poetic excursion into the lanes of the Fes medina. We are accompanied by the local Sufi Brotherhood, the Hamadcha, directed by their moqaddem or leader. The ceremony and rituals, the captivating charm of the old medina, the devotion that can be felt around the mosques, the gardens and houses hidden behind stone walls and the everyday business … all this will be filmed and then projected live, while the Hamadcha are invited to match their chants and music to the images. 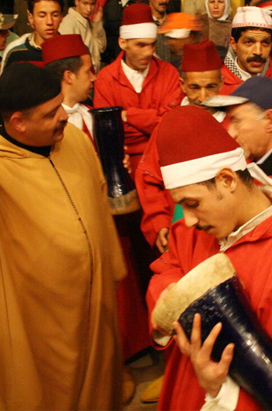 Like the Gnawa or Aïssawa, the Hamadcha are one of the ‘popular’ Sufi brotherhoods, and one of the largest in Morocco. Founded by the saint Sidi Ali Ben Hamdouch in the 17th century, their community has always been known for the originality of their repertoire of praise songs, their complex rhythmic style, their enthralling dances and the efficacy of their healing through trance. The Hamadcha ritual, like that of the Gnawa, is in effect a place of therapy. This is why they have for some time been considered expert therapists and solicited by families for their knowledge of spiritual medicine. Vincent Moon and Priscilla Telmon hunt down expressions of the sacred, document them and then transmit them. Like passionate muses, they use various media to try to find the best way to show it: installation, cinema, sound and visual creations. Studying one of their films or experiments (all freely available on the internet), is like entering into the very sensation generated by the music. The smooth image becomes a vibration through the details absorbed by the camera; as though they are allowed to live until the very moment of their deliverance.